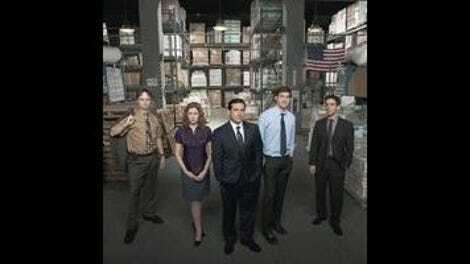 There was a time when the American version of The Office was more closely associated with Ricky Gervais and Stephen Merchant than it was associated with Michael Scott, Jim and Pam, or “That’s what she said.” That period ended sometime in the middle of the second season, when this Office stopped being judged strictly on the merits of that Office. Even as early as “The Dundies,” the show had established its own rhythms, tone, and symbols of American corporate drudgery (or preferred chain restaurants). The Office began from Gervais and Merchant’s concept, but their sense of humor and preoccupations would only define this take on the concept for so long. As such, it’s best to put the “written by” credit for “The Convict” in the back of your mind. Season three is full of these little all-star drop-ins, but they’re otherwise in the director’s chair. Joss Whedon, J.J. Abrams, and Harold Ramis brought a dash of personal flair to The Office, but they mostly behaved like guests in someone else’s house—or worked on episodes tailored to their sensibilities. The weird twist of this episode is that the guests built the house, but they’re mindful of the new owners. As a statement of The Office’s emerging identity, “The Convict” works from a Slough script, but the reactions are all Scranton. And at this juncture of season three, Scranton is on the defensive. Sure, it would’ve been nice to see the main cast taking the high road, attempting to welcome their new co-workers, but failing—sort of what Michael Schur and company did with the Pawnee side of Parks And Recreation’s recent municipal merger. But Dunder Mifflin Scranton is more skeptical of outsiders than anyone in Southwest Indiana, and making one of those outsiders a reformed, white-collar criminal is a not-so-subtle way of tapping The Office’s fish tank for 22 minutes. If there’s anything that made this the proper episode for Gervais and Merchant’s visit, it’s the choppy, topical waters of Martin’s race. The merger is high-tide for discomfort humor in season three, and “The Convict” performs the difficult discomfort-humor trick of telling jokes about a touchy subject that make the characters look bad without reflecting poorly on the show as a whole. And because Martin, like everyone else from Stamford, is depicted like a representative of the real world temporarily staying in The Office’s absurd reality, Michael’s overcompensation tactics land more cleanly than they do in, say, “Gay Witch Hunt.” It’s a cringe-inducing statement on topics that would induce fewer cringes if we would just talk openly about them—just not in the “wrong: That was a white woman” way Michael chooses. You can tell Andy’s going to stick around longer than anyone else from Stamford because he’s already being lured into Jim and Pam’s web of pranks. That runner is another illustration of the divides that form during the merger arc, fissures that separate internally as well as externally. Karen wants in on the game, but Jim balks—partially because it’s a Scranton thing, partially because there’s a flirtatiousness to Jim’s actions. He and Karen might be going out, but by feeding Andy false leads about Pam, Jim is pulling another girl’s pigtails, and it takes too long for him to recognize it. Clarity kicks in desk-side, and the look of puckish pride on John Krasinski’s face melts into the realization that his character shouldn’t be doing this kind of thing—it’s unfair to Pam and Karen. And that’s a uniquely American Office beat. Sentiment trumps humor a lot on this show, but the hurt and humiliation that Michael inflicts on his employees is balanced by other characters recognizing the little chunks they take out of each other. Gervais and Merchant were present for the period in which season three starts to transfer Jim’s underdog role to Pam, a dynamic that would help establish her as the most frustrated dreamer in Scranton. It’s a great turn for Jenna Fischer that leads to a couple of small victories at the end of season three—and all she has to do to get there is listen to a pig Latin-damaged, all falsetto version of “Rainbow Connection.” Someday she’ll find it, but not today. Curiously, the character who hewed closest to his British inspiration, Dwight, barely gets any play in Gervais and Merchant’s script. As partial compensation, Rainn Wilson gets that hysterical “Be cool” “I am cool” exchange with Michael. He doesn’t even need to hear who the convict is—Dwight Schrute just springs into action. TV Club Classic is a weird exercise in criticism, because judging a show by what’s to come is an ever-present temptation. In writing these reviews, I always intend to turn a blind eye to The Office’s future, but it’s next to impossible—I’ve seen that future, I know where things wind up, and applying that knowledge to what’s happening in the first three seasons is one of many valid ways of examining these episodes. That’s never been more true than in the case of “Benihana Christmas,” a perfectly fine holiday episode that also points a gnarled, bony finger at the place where The Office ultimately runs off the rails. The show’s move toward hour-long episodes was a practical development: “Christmas Party,” while one of the show’s peak moments, is bursting at the seams. There’s so much to explore in the setting of the Christmas party, so many chances to tell a longer story, and “Benhihana Christmas” attempts to do that. (Going the full hour is also a great way to pad out any potential syndication package.) But even in this first try, there are glimpses of the flabby, meandering hour-long installments that would open up season four. The cold open, usually such a crisp display of office-life vignettes, limps to a close; Michael’s “You know how all waitresses look alike” plot goes two or three beats too long. “Benihana Christmas” moves the show in the wrong direction, but it gets a lot of stuff right, too. There’s a nice “What if?” in the bonding that goes on between Pam and Karen, a theoretical whose unhappy ending is evident even to those who haven’t seen the rest of season three. Jenna Fischer and Rashida Jones have a bright, fun energy together—but more importantly, their characters also represent the ways that Scranton and Stamford could feasibly come together as one. Ditto the lunch/dinner/happy hour at Benihana (how long are they at that restaurant? ), which uses the added elbow room to drop some superb character work and a bit of light product placement. The circle of power plays between Jim, Dwight, and Andy can get tiresome—partially because Jim wants no part in them—but I love how Dwight gets boxed out at the table. The couple seated between him and the rest of his party are another example of the real world encountering Dunder Mifflin—and the real world responding accordingly, with chopstick swordfights and deadpan looks to the camera. They might not be regulars on the show, but they catch on quickly! This is all the perfect fit for the late Harold Ramis, directing his first of three season-three episodes. (He’d later return to the show for the second part of season six’s “The Delivery.”) It’s looser, more conversational, and grounded in character—the kind of stuff Ramis excelled at scripting as well as guiding from behind the camera. (You can almost imagine Bill Murray playing the Jim part when Jim bobs in and out of Dwight’s sightline during the “dream house” bit.) “Benihana Christmas” is also a minor snobs-vs.-slobs comedy in the classic Ramis vein, with Angela’s “Nutcracker Christmas” as the people of the Bushwood Country Club and “A Margarita And Karaoke Christmas” representing Al Czervik and company. If The Office has to wander, at least it has someone with experience in that kind of comedy holding the reins. The episode puts a bow on the merger plot, burying some of the hatchets while laying pipe for the episodes that followed in the fall of 2007. Who’s that on the phone with Michael? Is the spark between Pam and Roy reigniting? Hey, remember Darryl? “Benihana Christmas”’ margarita glass floweth over, but in its best moments, it effortlessly captures the feeling of an office party. Weird tensions hang over everything, and everyone’s too drunk to know when to stop talking, but it’s still nice to get a chance to gather together with everyone to celebrate the spirit of frozen cocktails, Styx, and double-fudge brownies. Michael’s “Skeasons Greetings” card is disturbing on multiple levels, but the most disturbing element goes unspoken: How did he get that picture, and how did he hold on to it long enough to make the scan? That’s future Who Charted? host/Childrens Hospital co-star Kulap Vilaysack as the waitress who has her arm marked by Michael. But does Scott Aukerman know that Michael is messing with his wife?